These days it’s hard to do without a little bit of cloud storage space, whether it’s for your holiday photos or your digital music, and Google just revamped its offerings with new price points, a new name, and some new extras. So how does Google One stack up against what you can get from Apple, Microsoft, and others? Here we’ll look at both the price tiers on offer and everything else you get with your cloud storage—like file syncing, online apps, and so on. For now, there’s not all that much to Google One, but it gives us a peek at what Google’s planning for the future. Right now if you buy some cloud storage space from Google and it gets spread between Gmail, Google Drive, and Google Photos, on top of the 15GB you get free of charge (YouTube videos don’t count)—that’s been the case for years, but Google One shakes everything up a bit. If you already pay for Google Drive storage, you’ll automatically get upgraded soon. Otherwise there’ll be a limited roll out for the rest of us. There’s a brand new URL for a start, presumably just to manage your storage and your plan (the likes of Gmail and Google Drive won’t actually change). A couple of the tiers are changing too: You can now get 200GB for $2.99 a month (a new tier), and 2TB for $9.99 a month (twice the storage you previously got). Google says customers already on the 1TB plan will soon get upgraded automatically. The other plans remain the same: 100GB for $1.99 a month, 10TB for $99.99 a month, 20TB for $199.99 a month, and 30TB for $299.99 a month. Remember Google launched a Backup & Sync tool for Windows and macOS last year, letting you archive any folder on your computer (like the desktop or your documents), whether it was inside your Google Drive folder or not. With the new lower cost tiers we’re now talking about one of the most comprehensive, most straightforward, and cheapest backup solutions on the market. Google is adding benefits to Google One too. Family sharing will soon be an option, so you can split your storage between as many as five family members and get billed to one account. Google is also promising “one-tap access to experts for help with our consumer products and services” for Google One customers. Apparently more benefits are on the way, including credits in Google Play and deals for hotels that turn up in Google Search. It sounds a little like Amazon Prime but for Google, though as yet the perks are a little sparse—better technical support and a few special deals. If these perks start to get ramped up over time, and maybe Google throws in the new YouTube Music service, then we’ll really be talking. That’s Google One; what has everyone else got? If you’re using Apple hardware you may well have defaulted to iCloud, which offers 50GB of room for $0.99 a month, 200GB for $2.99 a month, and 2TB for $9.99 a month, on top of 5GB you get for free. It all works seamlessly with Apple apps like Photos and Mail, and you can now back up certain folders from Mac and Windows computers to iCloud too. Microsoft’s OneDrive is tightly tied to Office 365. You get 5GB for free and can up that to 50GB for $1.99 a month, but you can also pay $69.99 a year for 1TB of room, with Office 365 for Mac or Windows thrown in as well. That’s $6 a month for the storage and the office suite, so it’s an appealing option for fans of Microsoft or heavy Office users. Dropbox, meanwhile, gives users 2GB of room for free and has two paid options for non-business customers: $9.99 a month or $19.99 a month. Both give you 1TB of cloud space, but the pricier tier includes a few extras aimed at creative professionals, like the option to build up a shareable portfolio of your work online. Those costs are broadly comparable, with the exception of Dropbox, which is now looking rather limited in both its range of plans and the price points it’s offering. You do at least get the added bonus of Paper, a better-than-you-might-expect tool for collaborating on documents inside your browser. But what are they like to use? Dropbox mastered the file syncing game long before Google, Apple, and Microsoft joined the party, and it remains a super-simple way of keeping folders in sync with the cloud and multiple devices. The syncing clients for Windows and macOS blend seamlessly into the background and you’d hardly know they were there. It works everywhere and has a ton of useful sharing features—like expiry times and password protection on your shared links. You can also recover deleted files for a period of 30 days, stream music and video on the web, sync files to phones for offline use, and so on. For syncing and sharing files, and all the tools you need for that, it’s hard to beat. iCloud and OneDrive both have similar advantages and disadvantages: Superb integration with other products from Apple and Microsoft respectively, but a certain clunkiness on the web, and limited support for jumping across mobile and desktop platforms (there’s no iCloud app for Android, of course). iCloud and OneDrive eschew the ‘one synced folder’ approach of Dropbox to back up other bits of macOS and Windows (such as folders on the desktop), if you want them to, but neither implementation is particularly intuitive—as you might expect from cloud services built retroactively to fit desktop OSes that were already well established. Apple’s service has the edge in terms of invisibly and elegantly taking care of all your app and iOS backups, but Microsoft’s offering is perfect for Office users, so it’s a question of which software packages you’re spending more time in. At the same time, neither iCloud nor OneDrive do syncing and sharing quite as intuitively as Dropbox. And Google Drive’s syncing and sharing options aren’t quite up to the standard of Dropbox either. It doesn’t work as well with Office as OneDrive does, or fit as neatly into iOS as iCloud does, but when you take all of the features into account and treat them as a whole, it nevertheless ends up being the best option overall. We all know about Google’s web app expertise, and when you log into the (newly redesigned) Google Drive interface in your browser, it feels like you’re using a fully featured file management app rather than something developed as an afterthought (take note, Microsoft and Apple). It’ll work and sync files across Windows, macOS, Android, and iOS, and when you throw Google Photos into the equation and the online office apps built into Drive, it’s easily the most comprehensive option out there for getting at your stuff from anywhere. 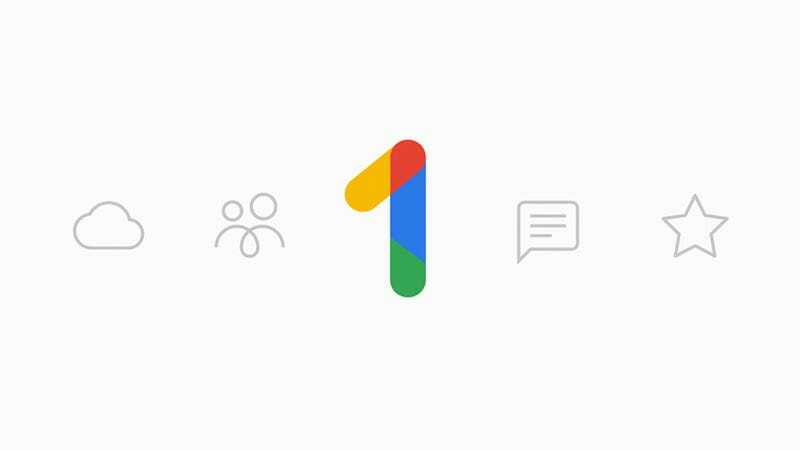 For now, Google One hasn’t moved the needle much, besides a couple of new pricing tiers and the promise of some extra benefits that we’ll have to wait to see. But if Google can get it up and running quickly, then the others have an even bigger gap to make up for.